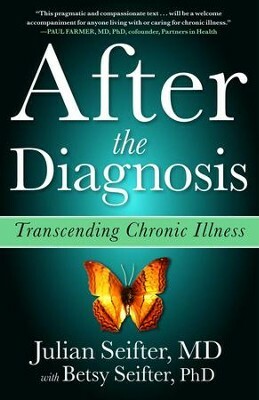 After the Diagnosis is a heartfelt and moving lesson on the art of living well through serious illness. Dr. Julian Seifter understands the difficulty of managing a chronic condition in our health-obsessed, take-life-by-the-horns, live-forever world. When he found out he was suffering from diabetes, he was an ambitious medical resident who thought he could run away from his diagnosis. Good health was part of his self-image, and acknowledging that he needed treatment seemed like a kind of failure. The message, in short, is: You are not your disease. You are you. Paradoxically, rather than destroy your identity, the experience of sickness can deepen your sense of who you are and what you can become. Julian Seifter, MD, is one of the leading kidney specialists in the country. He is an associate professor at Harvard Medical School and chair of the committee on Protecting Patients in Human Research at Brigham and Women’s Hospital in Boston. He has traveled widely, making trips to China, Russia, Turkey, Europe, South America, and Southeast Asia. He has a wife, two grown sons, a fishing boat, and a great collection of 1950s baseball cards. He’s living—trying to live—a good life, even as time and illness take their toll. Betsy Seifter, PhD, an editor, teacher, and a writer, graduated from Swarthmore College and received her doctorate in English literature at Columbia University. She is coauthor of The McGraw-Hill Guide to English Literature, volumes I and II. Here's a doctor who understands his ailing patients all too well. Seifter, a noted kidney specialist, Harvard Medical School professor, and a diabetic, presents a poignant tribute to those who have faced their illness "in just the right way": neither denying the illness nor becoming totally identified by it. Seifter notes that such patients are remarkable not just for their coping skills, but because they embrace their lives despite their disease. There's Sheila, who invented an alter ego named Lucy to preserve her "selfhood" while battling a rare, inflammatory disease, ex-Boston cop Bill O'Malley, who refused to have life-saving dialysis, choosing quality rather than quantity of; and Rose, diagnosed with breast cancer, who discovers that her illness has given her life deeper meaning. They all, Seifter notes, found a way to forget about their illness and immerse themselves in the lives they chose to live. And their stories help the doctor deal with his own chronic disease--and offer an important lesson for the rest of us, too: when we're sick, "tolerance, forgiveness, and acceptance" will help us stay alive with joy and purpose. (Aug.)Copyright 2010 Reed Business Information. I'm the author/artist and I want to review After the Diagnosis: Transcending Chronic Illness - eBook.